Suneng Power brings you into the colorful world!!! This star shower lights with solar powered built-in 2200mAh battery,No wire needs to be connected you can use it not only outdoor but also indoor. Easy to install only need stick into the ground or wall mount, auto motion turn on at night and off at daytime. For the first using,please charge it firs( turn on the projector,take it under the sunlights. TWO MODES LIGHTING: Flash mode and normal, One switch design, hold on press about 2s the projector on, then press one time the mode changes. 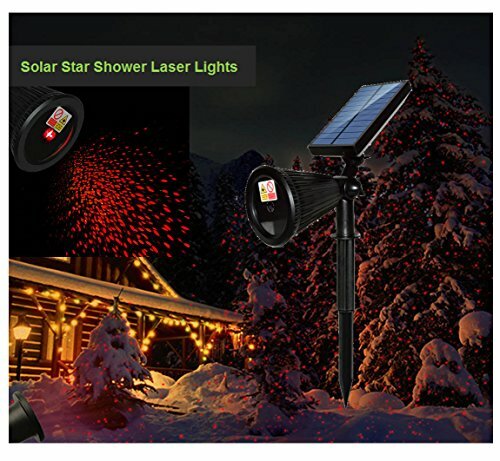 ADJUSTABLE AND WATERPROOF: lights head 130 degree adjustable, solar panel 165 degreen, the star shower laser lights with IP65 waterproof,it can work normally under all kinds of weather outdoor. WARRANTY: Suneng Power Bring you into the colorful world, For all our products Provide ONE-YEAR replacement OR risk-free refund, Never worry about Anything. If you have any questions about this product by Suneng Power, contact us by completing and submitting the form below. If you are looking for a specif part number, please include it with your message.